Time, Rate, Place and Source - get them all Right. Key factors such as timing, rate, source and placement need to be considered when determining nitrogen efficiency in broad acre crops. Grain farmers need to develop a flexible nitrogen management strategy in order to gain the best results for their cropping systems. Research and experience have shown that there are different dimensions of nutrient use efficiency (NUE) and critical questions farmers need to ask to gain the most effective and efficient nitrogen uptake in crops. Nitrogen use on grain crops is now a tactical issue in response to seasonal conditions, and is always a topic of conversation. Some growers worry that they skimped and missed yield while others may think that what they applied either did not work or gave only a small response. Others worry that there were big losses in what they applied so wasted a lot of the nitrogen applied. The development of a nitrogen management strategy should consider these tactical issues but this rests within the general approach of a soundly based and regularly reviewed nitrogen budget. Making and reviewing yield estimates is critical, as the yield potential will be a function of the nitrogen demand in rain-fed environments. The budget should include nitrogen supplied from the soil, as well as profile nitrogen plus in-crop mineralisation, and the efficiency with which the nutrient gets to the product – termed nitrogen use efficiency (NUE). The key is knowing how much nitrogen is already in the ground (soil test and mineralisation estimates) as well as what is taken out of the ground via the production of a crop is vital for effective nitrogen management. At a whole farm level, the assessment efficiency can be made using a partial nutrient balance (N removed in grain/N applied) and partial factor productively (grain produced/applied). The measurements are partial because they only deal with fertilizer input and nutrient removal in grain and do not consider other input pathways (nitrogen fixation for legumes, nitrate from rainfall, mineralised nitrogen from organic materials, and nitrogen in irrigation) or loss pathways (nitrification/denitrification, leaching, ammonia volatilization, fixation in organic materials). = Ug/F 0.1 to 0.9 kg/kg; >0.5 where background supply is high and/or where nutrient losses are low. Australian figure for cereals is 0.82 kg N removed/kg N applied. = Y/F 40-80 kg/kg: >60 in well managed systems, at low N use or at low soil N supply. 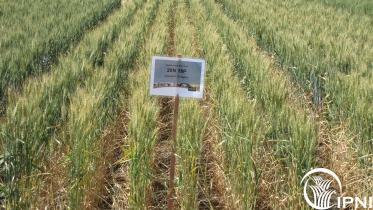 Australian figure for cereals is 52 kg grain/kg N applied. These factors are all important in the decision process of timing, timing, rate, source and placement, which will help farmers increase effective and efficient nitrogen use. Applying nitrogen early in the season, or prior to seeding, is generally the more common practice, but this is often the time farmers know least about what is happening in the growing pattern, and hence, not the best strategy. The earlier nitrogen is applied, the larger the yield increase, while the later the nitrogen is supplied even up until flowering, the larger the protein increase. The time at which the nitrogen is supplied will most affect the tissue that is actively growing at that time. Early nitrogen application stimulates shoots or tillers, while later nitrogen application can increase stem growth. Once active stem growth slows, later nitrogen can be used in grain filling, but the contribution to yield is small. The other aspect is timing relative to rainfall. Most growers would try to time application of urea ahead of rainfall, so that the losses of nitrogen as volatilized ammonia are reduced. The amount of nitrogen lost from surface applied urea has been a topic of significant research over the past few years, especially with the commercialization of urease inhibitors. The range of losses depends on soil moisture, stubble loads and canopy thickness, as well as wind, temperature and rainfall. The key question here is if the crop is actually nitrogen limited, and unless this is the case there will be no response and so efficiency will be low. Nitrogen budgets reviewed with yield estimates such as from Yield Prophet® are useful to estimate demand, while supply from deeper in the soil or mineralised nitrogen will also be important, although the ability to estimate in-crop mineralisation is still more art than science. The rate can be determined based on having adequate nitrogen in the crop by anthesis to match the yield and protein target. A 3.5 t/ha, grain yield will probably come from a biomass at anthesis of 7 t/ha. To meet an 11% protein target, grain should have around 120 kg of nitrogen. If the post-anthesis conditions are better than the target, then nitrogen will be diluted by the extra growth and grain protein decline. If conditions worsen, grain protein increases. So, the actual yield response will depend on the nitrogen rate meeting the gap between the target demand and expected supply neither of which are known in advance. Therefore, there is some luck here in what outcome occurs. Table 2. Responses of wheat (cv Yitpi. 2001, Longerenong) to 20 kg N/ha applied at different crop stages, relative to nil added N.
Table 2 shows the results of a small experiment where 20 kg N/ha was applied as urea at different times to a wheat crop at Horsham. The later applications gave progressively smaller yield responses, while the protein response increased, except when applied during early dough. This also shows that the 20 kg N applied showed lower recovery as application delayed. Norton says there have been many trials and comparisons made of the source of applied nitrogen, such as granular urea, liquid urea or liquid UAN. The trials have been made at similar times and generally show only small differences and yield responses. For surface applied nitrogen, two experiments showed losses to ammonification as urea (23%), urea/ammonium nitrate (12%) and sulfate of ammonia (12%) for nine days between application and light rainfall on an alkaline vertosol. In a similar earlier experiment, the loss of nitrogen from urea can be reduced from 10% to 1% of applied nitrogen through the use of an urease inhibitor, although the efficiency of this reduction was reduced at higher temperature and higher soil organic carbon content. At Birchip in 2013, trials showed that nitrogen uptake from both UAN (streaming nozzles), urea solution (flat fan nozzles) and dry urea (top-dressed) was similar 10 days after application (DC31). However, by anthesis the UAN (streaming nozzles) and dry urea had more nitrogen in the crop than the urea solution. By maturity, there were no yield differences, although the UAN and dry urea had higher grain protein contents than the urea solution. Norton says fluid fertilizers offer the opportunity to combine two operations, thus reducing paddock traffic, as well as giving options for additional nutrients, such as sulphur or micronutrients. As well, the use of fluid fertilizers offers more uniform application and some benefits in materials handling. There are also many other factors at play rather than just selecting a nitrogen source to get more nitrogen into the crop, and then achieving a profitable yield response. However, there would need to be compelling circumstances, such as where expected losses are high, to justify moving away from top-dressed urea, provided as the season unfolds. Pre-drilling nitrogen will mean it is isolated from losses due to ammonification, but denitrification and leaching can occur under wet conditions. The demand for nitrogen by the crop early is important, and having an adequate supply up-front mean that the crop can access it with minimal loss. However, putting all the nitrogen up-front would suggest good efficiency, but this is when seasonal conditions are least known and so demand is still being formed, and the decision on rate can only be adjusted up, not down. It is also important to caution about fertilizer, especially urea, placed in a seed-row. Poor establishment due to damage to germinating seeds can be significant with wide rows, narrow points, light soils and dry conditions. Inter-row banding pre-crop or even in-crop (side-banding) is an attractive option as it buries the nitrogen, but the technologies for in-crop application still require refinement. In most situations, the placement for in-crop application will be over the top of the crop. For dry fertilizers, most will end up on the soil and the fate for urea is to become either ammonia which can be lost, or as plant available ammonium or nitrate. Leaves can absorb inorganic and organic nitrogen sources and small pores within leaf cuticles can take up urea, ammonium and nitrate. These pores are lined with negatively charged molecules, therefore, the uptake of cations (such as ammonium) is faster than anions (such as nitrate). Furthermore, the uptake of small, uncharged molecules, like urea, is often fast. Urea is commonly used for foliar fertilization because it is uncharged, has high solubility and can be rapidly and efficiently absorbed by leaves. For fluid fertilizers, such as urea or urea and ammonium nitrate solutions, depending on the application equipment used, some proportion of the material will intercept the crop canopy and some will hit the soil. Once on the soil, the loss processes are the same for dry fertilizers, but the nitrogen on the canopy can be taken up through the leaves. Foliar applied nitrogen has been proposed as the most efficient method to present nitrogen, and urea is rapidly and effectively taken directly through the leaf surfaces. For highest efficiency, coverage should be good, but crops are susceptible to damage both from urea itself, as well as the salt effect of the solution. This urea toxicity will dictate the upper level for effective nitrogen uptake, and it is probably around 10-15 kg N/ha depending on crop cover, ambient conditions, and application technology. Streaming nozzles rarely place fluids on the inter-row rather the canopy, and while reducing canopy damage, they do expose the material to soil surface losses under the canopy. An important aspect of ensuring nitrogen is used efficiently and effectively is to check that other issues such as sodicity, salinity, acidity, other nutrients, pests, weeds or diseases are not the limitation. A simple way to do this is to use a N-rich strip in a paddock. This will serve as a reference for later in the season as well as give some early indications if additional nitrogen is giving a response, and even if further nitrogen could provide extra benefit. Observe the progressive decline of nitrogen in the soil and keep modifying to re-adjust to your target level. But, there is no silver bullet to all situations; options will always vary year to year. And even with the best intelligence and the most carefully planned approach, luck still plays a part. ·	Efficiency and effectiveness are different dimensions of nutrient use efficiency (NUE). A system level assessments of NUE can be made using a partial nutrient balance (N removed in grain/N applied) and partial factor productivity (grain produced/N applied). ·	Early N is generally used more efficiently, but the source, rate, timing and placement all affect the efficiency with which the crop can access N.
·	When comparing N sources, rate, timing and placement all interact so that efficiency options vary and no single source is a “silver bullet” to all situations. ·	There would need to be compelling circumstances to justify moving away from top-dressed urea, provided as the season unfolds. ·	Try N-rich strips in fields to see where the response could be sitting. ·	Unless springs are good to very good, there will be little benefit from N applied later than booting, and much of this will be as a protein response.